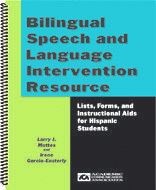 The Bilingual Speech and Language Intervention Resource includes information and materials that will help you plan and implement speech-language intervention programs with bilingual children and adults from Hispanic backgrounds. The book includes ready-to-use word lists, record forms, informational handouts, and practical suggestions for program implementation. The book includes guidelines for distinguishing communication differences from disorders, selecting the language of instruction, developmental norms for Spanish speech and language acquisition, and ready-to-use materials to help you implement intervention programs. Issues related to bilingual language acquisition, code-switching, dialectal differences, use of "Spanglish" and MORE are presented in an easy-to-understand format. The book even includes informational handouts that you can give to parents and teachers. You'll use this book EVERY DAY with students from Spanish language backgrounds. Both monolingual and bilingual professionals will find this book to be valuable in meeting the needs of their clients. Helpful tips for monolingual speech-language pathologists ... AND MUCH, MUCH MORE! In addition to offering valuable information about treating communication disorders in English or Spanish, this book includes the hands-on materials that you need TODAY for children, adolescents, and adults. This is an essential resource for professionals who work with Hispanic students in either English or Spanish. No other resource has SO MUCH practical, useful information! Save $10.00 off the suggested bookstore retail price of $49.50 by ordering now.